As my regular readers already know, this month I have been trying to live off the food already in my pantry and freezer, and only spend $25 per week to keep my family of 5 afloat. This is only week one and so far I’ve had no trouble, but I did run into one stumbling block.. I wanted to make pulled pork and I had NO bottled barbecue sauce in the house! OH THE HUMANITY! I knew I had everything I needed to make my own BBQ sauce, and so I did just that. I did have to make a few substitutions, which I’ll note in the recipe below, but it still came out FANTASTIC. I just loved the spicy sweet flavor, and since I slow cooked the entire pork roast in the sauce (not just added it at the end) it was there in every bite. Most of the ingredients are things you probably have in your fridge already, or can find substitutions for. Ironically, I didn’t have any regular Bourbon so I used cinnamon flavored (aka Fireball), and it was actually pretty good, you got just the SLIGHTEST hint of cinnamon. (I wouldn’t substitute it with Schnapps or anything but it wasn’t a deal breaker. 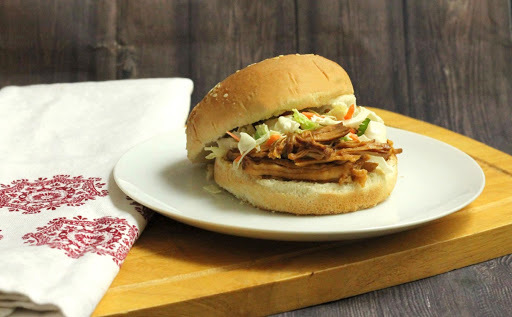 Slow cook a pork roast in this sweet and spicy homemade barbecue sauce for scrumptious shredded pork barbecue sandwiches. Combine all the ingredients except the pork in a slow cooker and mix well. Add pork roast to sauce making sure to completely cover the meat with sauce. Cook on low for 8 hours or high for 4 hours until pork reaches 160 in the center. Shred using two forks and serve. The sauce recipe is also great alone. Just simmer over low heat reducing sauce to thicken. Serve over meat or chicken. Can be stored covered for up to two weeks. You guys! This is really really good! I mean, sure, cinnamon whiskey is for hipsters, but it is still darn tasty in barbecue!